As most of you know Monday night we look after Jack but as I'd been to work all day and it would have been my Mam and Dads Anniversary I wanted to pop to my Mams so we took Jack with us. Mam loves to see him and he just melts our hearts he is a busy little fellow and fully walking now. My poor Mams cat "Jess" darts out of the room as soon as she sets eyes on Jack to which Jack thinks it is one big game called scare the cat wittless ha ha! Anyway here is our beautiful little fellow twinkling his blue eyes at you all. Awwwwwwwww isn't he just gorgoeus Jak. He's gonna break a few hearts when he's older. Give him a hug from this cyber aunty. He is so pretty Jak! 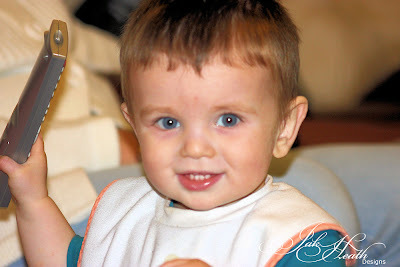 It is good to see little Jack happy and healthy! Handsome little man, And at a great age, our grandson is 15 months, into everything, makes me laugh so much with the things he does. No wonder he melts you hearts Jak....those beautiful twinkly eyes...he's just adoreable. He must have cheered your Mum and yourself up no end on a sad day. God bless the little sweetie. Ah Jak! I have one of these - aged 18months. What a joy they are! He's a real cutie-pie. You are very blessed. uh oh, jak! He's not looking so much like a baby anymore, now he is looking like a little boy! Enjoy these times, they go so fast!! He is soooooooooo gorgeous - beautiful blue eyes!